Another cool online casino that you can check out, if you are looking for fun gambling in a secure environment, is Europa casino. This casino has great visual appeal, a cool range of games, player-friendly features, and is completely secure. 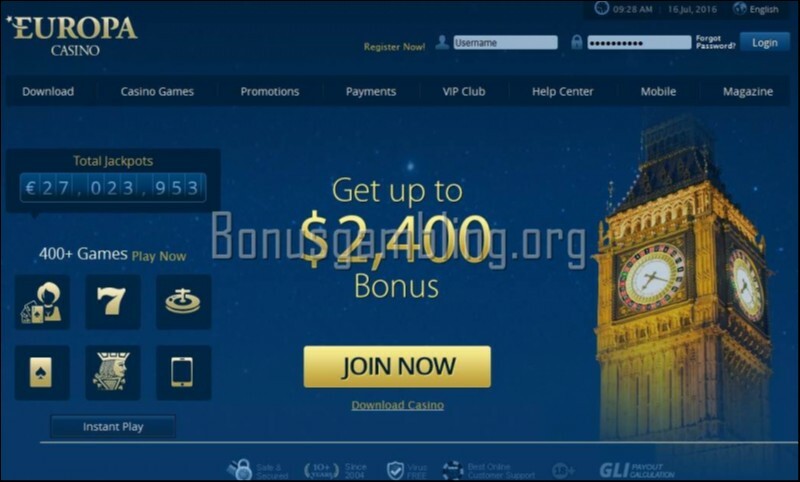 The casino is available in multiple languages, and is quite popular among online gambling fans. Europa casino comes with a well-designed home page that has superb graphics and animations. The casino also has a superb layout, which ensures easy navigation. The home page has all the important links that you may want to click, ensuring you do not have to waste time searching for these links. The casino looks spacious and uncluttered, which gives it a relaxed look and feel. Europa casino is driven by software from Playtech, one of the better known names when it comes to online gaming software development. You have to download the software to your computer to play the games available. The Playtech software provides Europa casino with a range of cool features – brilliant graphics and sound effects, cutting edge animations, transaction tracking, game history tracking, multi-lingual availability and customer support, a good selection of games, multi-table gaming, and more. You can choose from more than 80 different games when you come to Europa casino. The games available include slots (single-line, multi-line, and video slots), table games, card games, video poker, specialty games, and also bonus games. You get excellent customer support at Europa casino, as you may rightfully expect in a popular online casino. You can get answers to your questions or resolution for any problem you may be facing at the casino by contacting a member of the casino’s customer support team. This team is available 24x7 through telephone, fax, and also e-mail. The casino also has a FAQ section that you can access for answers to your queries. You are guaranteed a completely secure online gaming environment at Europa casino thanks to the use of advanced security technology like SSL encryption. The casino also provides completely fair gaming. You have to be over 18 years old to play the games available at this casino. Europa casino is incorporated under the laws of the Government of Antigua and Barbuda. It is licensed and regulated by the Gaming Commission of the Government of Antigua and Barbuda. This casino does not accept new players from the US.